The Deal of The week starting today is Portal: Still Alive. Still Alive is the same great Portal experience you remember from the Orange Box, except there are a few extra challenge maps and new achievements to unlock. $10 for this game is a great deal, and those that have never been through the Aperture Science facilities. "As unwilling test subjects in a sinister laboratory, players must break the laws of physics using ‘portal’ technology to solve puzzles and survive. Featuring a darkly comic story that weaves adventure with brain-bending puzzles; ‘Portal: Still Alive’ also introduces 14 brand new bonus puzzles to challenge even the most skilled test subjects. 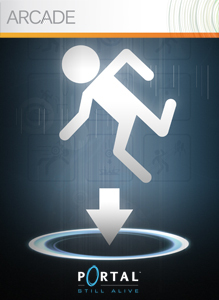 Players can also get a glimpse into the making of ‘Portal: Still Alive’ with commentary from the developers."